Costa Rica directly translates to “rich coast” because it was once thought that the land was rich in gold. Though it may not have tons of gold, it is rich in biodiversity. Even though the country holds 0.5% of the earth’s land mass, it has 5% of the biodiversity. Making this the ideal place to go on a jungle adventure. Arenal Volcano National Park is a prime example of the biodiversity and adventure that is offered in the country. It is famous for it’s perfectly coned shaped volcano, hot springs, and little town called La Fortuna. Before I get to my recommendations, I want to emphasize how important it is to have a car when you come here. Public transportation is not available and taxis are hard to find. I used RentalCars.com and had a great experience. Important note: You must get local insurance because all car insurance has to be approved by the government of Costa Rica. What we did was make our reservation on RentalCars.com but did not use their insurance. Instead we got insurance at the desk while picking up our car. 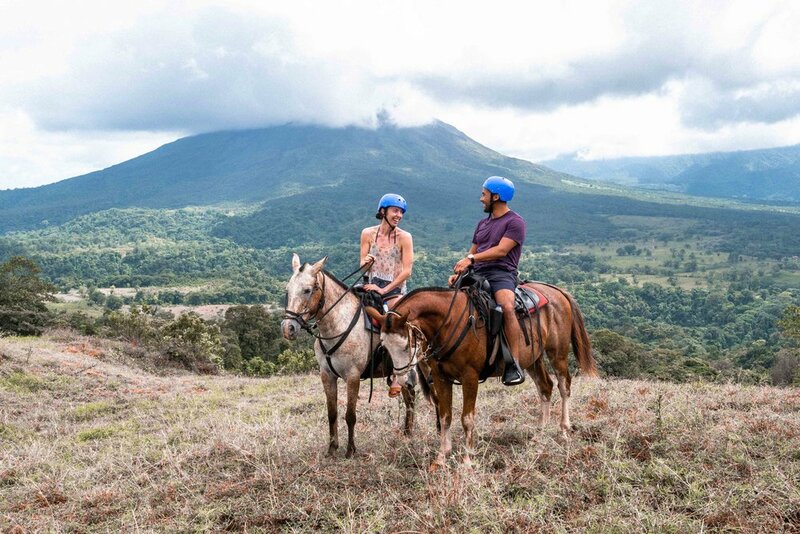 There are many adventurous things to do in Arenal Volcano National Park. If you’re looking for a one stop shop for it all I recommend going to Mistico Hanging Bridges Park. Here we did zip-lining, waterfall rappelling, horseback riding, and explored the jungle canopy on hanging bridges. We booked one of their combined tours. I think this is a good idea if you have limited time but still want to experience Arenal Volcano National Park to the fullest. I encourage you to try the waterfall rappelling. 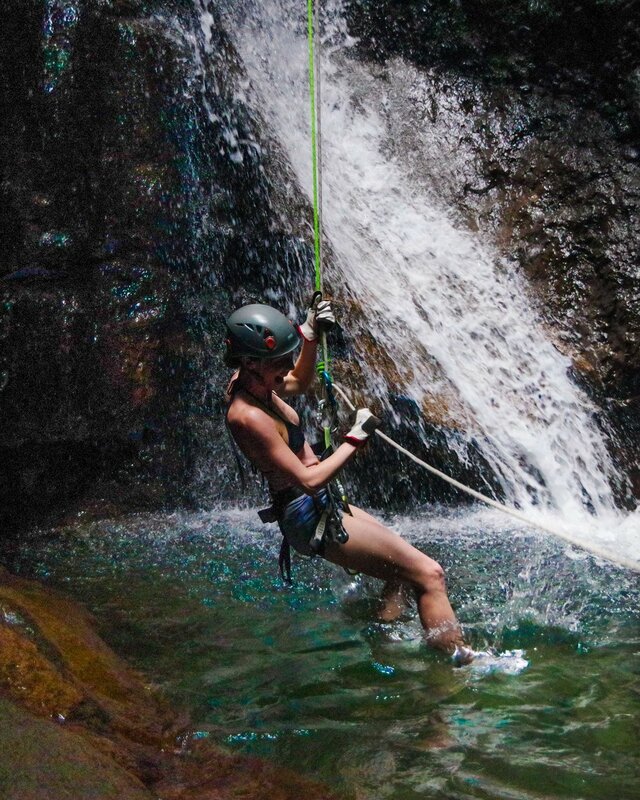 It was not as scary as it looks and is a great way to experience the Costa Rican jungle first hand. Wear active clothing that you are comfortable getting wet in and closed toed shoes. There is a restaurant here that serves tasty food at a reasonable price. It has panoramic views of the Arenal Volcano. Costa Rican’s have a discounted price. If you are Costa Rican, bring your national ID. Photos are $20 for the first person in your group then $10 extra per person. They are very high-quality and worth it! An icon of this area besides Arenal Volcano is La Fortuna Waterfall. This is a 230 foot (70m) waterfall that is surrounded by the jungle. To get here you will need to pay a $15 entrance fee, then walk about 10 minutes down steep stairs to its base. A fun part about this waterfall is that you are allowed to swim in its aqua blue waters. However, the rocks surrounding the waterfall are jagged and very slippery. When I went I did not have water shoes. This made it very difficult to climb down into the pool at it’s base. I recommend bringing or buying water shoes if you want to come here. There is also a restaurant here, however, it doesn’t have great options and is priced for tourists (aka expensive). Instead, I recommend bringing food to have a picnic or not eating here. It is $15 for entry for non-Costa Ricans. If you are Costa Rica you will need an ID to prove it to get the local price ($7). La Fortuna is famous for the wide variety of hot springs. As you drive along its winding roads, you’ll notice that many locations advertise hot springs. However, most you need to pay to get in. Lucky for me, a local friend taught me about a local spot that is free. I recommend going to the free hot springs instead of paying for one at a hotel. The one locals showed me is located directly across from Tabacon Grand Spa Thermal Resort. You can park your car on the side of the road and then walk down the street diagonally across from Tabacon to a dirt road. Follow the dirt road for about 150 meters and you’ll find the entrance to the hot springs. At first glance it looks like a tunnel under a bridge but if you go through the tunnel you’ll see a bunch of people laying in the water. Feel free to bring a drink, such as beer, water, or juice. Many people are drinking while enjoying the springs. I was told that at night they light candles here for a nighttime experience. You can see melted wax on many of the trees and stones because of this. Bring water shoes as it is quite rocky. Costa Rica stands apart from its Central American neighbors because of its sustainable tourism, and biodiversity. I spent a month exploring the provinces of San Jose, Cartago, Alajuela, Guanacaste, and Manuel Antonio National Park. San Jose is Costa Rica’s capital. It’s often a spot that is overlooked by travelers but there are tons of cool things to do here. Costa Rica directly translates to “rich coast” because it was once thought that the land was rich in gold. Though it may not have tons of gold, it is rich in biodiversity. Even though the country holds less than 1% of the earth’s land mass it holds 5% of the biodiversity. Making this the ideal place to go on a jungle adventure.